1. 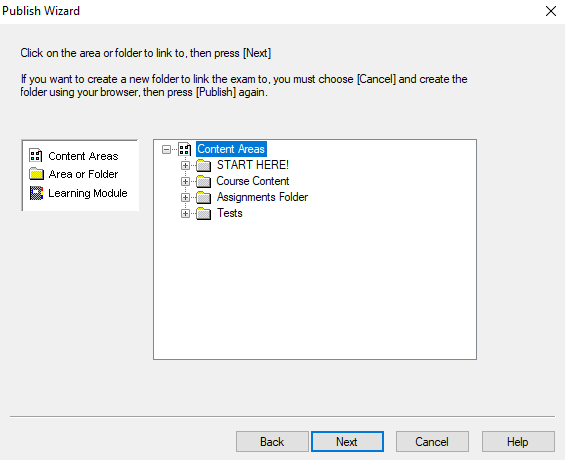 Launch Internet Explorer and log into UNI Blackboard Learn first. Note: You must use Internet Explorer to login, not Google Chrome, Mozilla Firefox, or Microsoft Edge. 2. 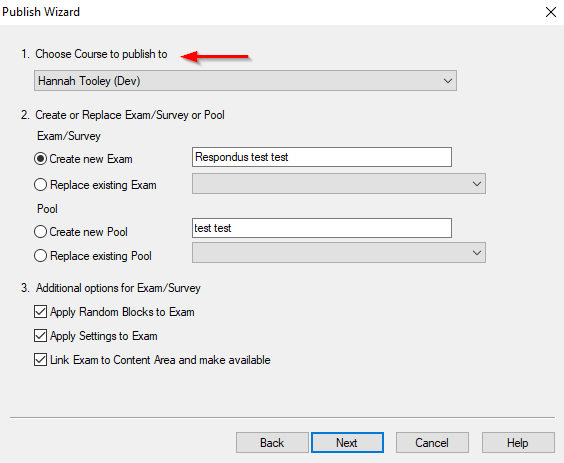 Select test you want to publish in Respondus (or create/pull a new one). 3. 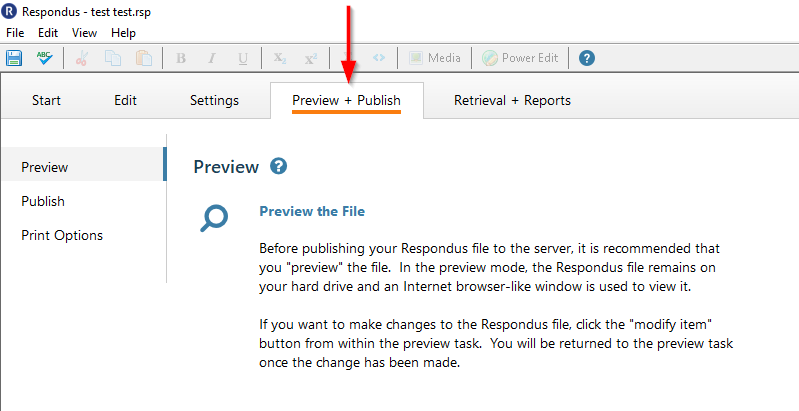 Once you have selected a test, click on the "Preview + Publish" tab. 4. From the sidebar, click on "Publish" and then click on "Publish Wizard". 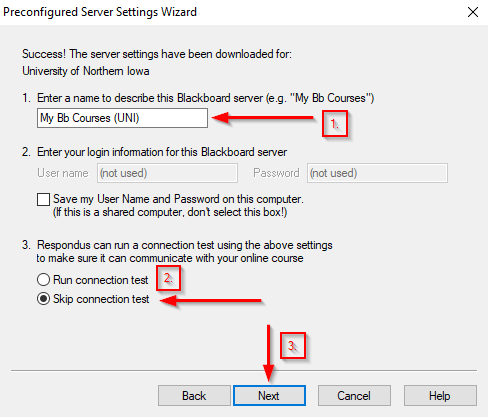 Note: You will only need to set up the connection to the UNI Blackboard Learn System once (steps 5-7). 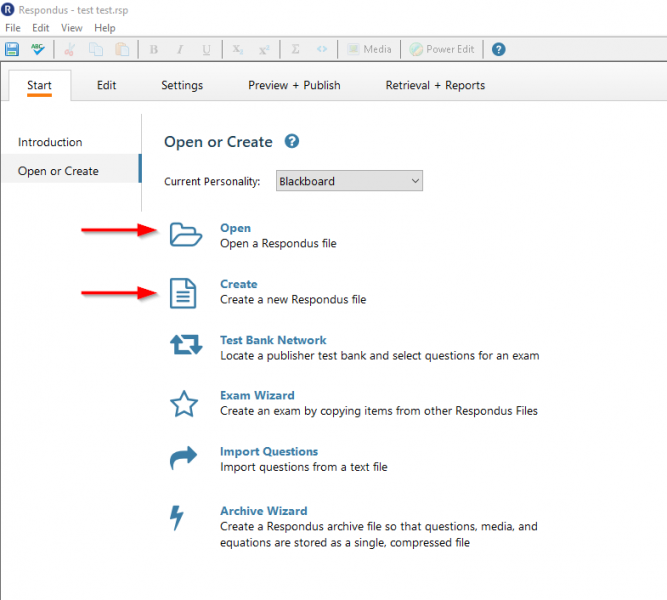 If you previously published tests using Respondus (before Blackboard's August 4th, 2018 migration to the cloud) but are currently experiencing problems connecting, you will need to delete the old server and reconfigure the newest server. 5. Click on field next to "Blackboard Server". Select "-add new server-"
6. 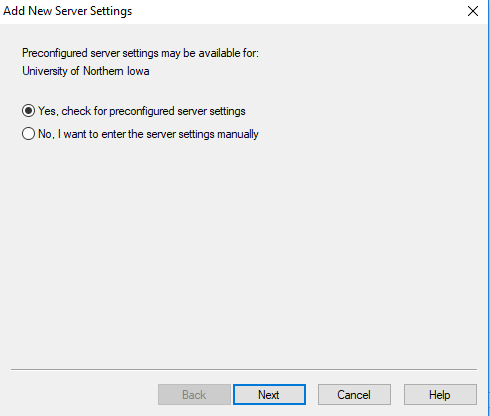 Make sure “Yes, check for preconfigured server settings” is selected and click the "Next" button. 7. On the 'Preconfigured Server Settings Wizard' page, name the server whatever would make the most sense to you (i.e. "UNI Blackboard Learn or UNI Bb Learn"). Make sure to select "Skip connection test" before clicking "Next". 8. Once you click the "Next" button at the bottom, this will launch the "Blackboard Authentication" window. Login into to Blackboard Learn in that window via the CatID link. 9. When you are successfully logged in, click the "Close After Login" button in upper right hand corner of that "Blackboard Authentication" window. 10. 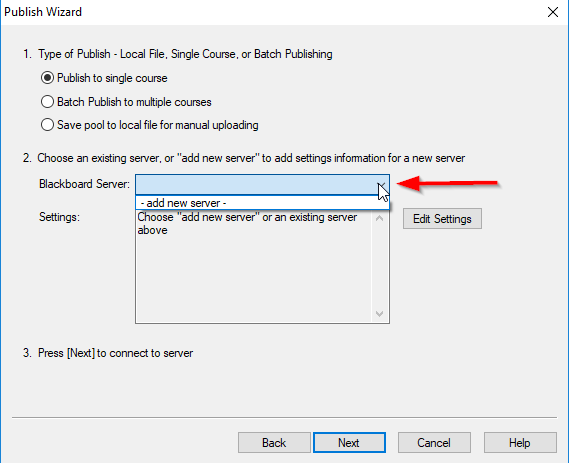 This should return you to the "Publish Wizard" and automatically advance to the next screen where you can now select the Blackboard Learn course in the first drop down menu. Then click "Next". 11. Then, select the folder you want your test to appear in and click "Next". 12. After it finishes uploading your questions, click "Finish". Your test will have been uploaded to the folder you selected in the last step.